Whether you like them straight, skinny, bootcut or anything in between, Defacto Industry has a pair for you. Defacto Industry ensures its customers custom-made, great-fitting jeans (in no more than 7 days, at that!) They are going to let you choose the cut, fabric, thread colors, style and pocket design. Oh, and it doesn't end there. According to their site, you can even suggest any other things that you want to add to the design of your jeans, and if they can do it, you'll get your wish. 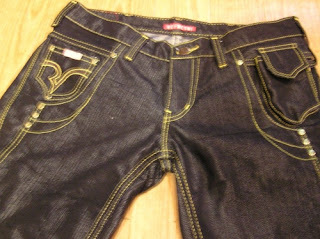 According to Defacto Industry, all of their jeans have the "Base Price" of 1500Php. It can go higher, I suppose, because they told me that "only the design would dictate the price." Here are some of my picks. 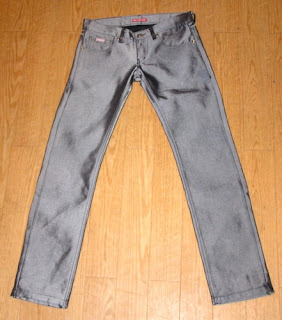 The Silver Jeans above, sold for 1500Php, is a very eye-catching pair. Just don't overdo it. 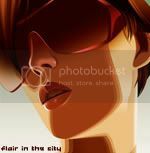 Wear it with a top, bag and heels that are NOT shiny. 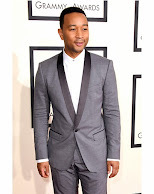 You don't want to look like a walking disco ball, do you? Show your little music library some love. Their iPOD Engineered Jeans are called such because of the special iPOD pocket on the side and the fact that it's, well, engineered. 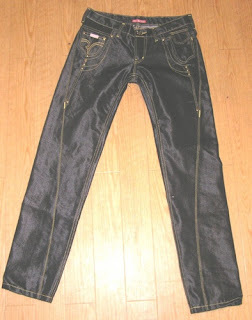 It's made of black denim and has a metallic finish. Very cool indeed. 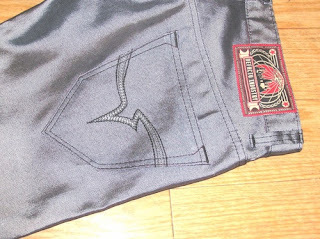 Engineered Jeans go for 2700Php, but you'll have to request for the price of the iPOD version. Shine in your very own metallic denims at a party and you will surely stand out. You can find Defacto Industry at V8 Indie Boutique, Unit 112 G/F Mile Long Building, Amorsolo corner Herrera St., Legazpi Village, Makati. They're open from 3 p.m. to 8 p.m. on weekdays and by appointment on Saturdays. For more information, log on to their Multiply account where they also have photos of their designs. like the ridiculously priced viktor jeans? thanks for letting me know about this. :) is the type of material stretch?